Our starting point for this is recognizing, as others have pointed out, that many, if not most, of those active on the left do not believe in political organization.1 There are many reasons for this, but the reason voiced most frequently is that they do not see a need for organization. Beyond broad social movements, they view many of today’s groups as being disorganized and irrelevant. Others are put off by the poor internal culture of today's organizations with their tendencies for personalizing conflicts, being unable to have constructive debates, and the culture of battles in meetings that seems to isolate rather than integrate members into broader society. The closest experience with left political organization is commonly that of the lone leftist selling strange newspapers at rallies. Frequently political organization as a whole is solely viewed through the prism of negative experiences with members of the worst of Leninist organizations with sectarian approaches to debate and relating to other political forces within organizing spaces, attempts to dominate and control leadership of struggles, and a ‘newspaper as transmission belt of political line’ approach to politics. Those on the left broadly adhering to anarchism fare only somewhat better, in our experience mostly falling into the previous three objections or alternatively the turn away from political organization is based on a reaction to the weakness, political immaturity, and lack of experience observed in existing political organization efforts. These experiences though valid, involve a failure to think beyond the present; a failure to consider the possibilities of the future. We believe that political organization, rather than being a distraction or worse destructive, addresses problems in struggle today. The need for the political organization of militants roughly falls into two categories: immediate and practical needs, and broader political vision and strategy. First we must start with why political organization can address the practical and immediate needs of movement. As resources become more scarce, people are displaced, unemployment takes it's toll, and communities are dispossessed of their long standing resources, the need for a united and coordinated means of organizing and fighting grows more crucial. Not having political organization means relying on the winds of chance when organizing efforts emerge, to bring together militants under various banners and projects, cobbling together resources for each fight, and then scattering to the wind again once the fight subsides, often leaving behind little analysis of strengths and weakness of the fight that occurred. Further, the relationships and politicization that arise out of fights are often not furthered and maintained in order to continue to build future fights. Common concerns and objections, raised by the most active and intelligent militants, within our organizations focus on our local strength and our relationship to social movements. If we are too weak locally to function in an effective capacity, how will we build a national organization? If our commitment is to struggle in and to build social movements, and our capacity is limited locally, won’t a national organization take away from those efforts? Perhaps we need such an organization, but with the state of the left and the poverty of our forces is it not a better use of our time to focus on building up the movements and small circles of affinity that will at some point down the road make political organization possible? Is it possible to build an organization that relates to movements and ‘everyday people’ and not just the usual suspects on the left? Moreover, political organizations don't have much to show for their efforts, so wouldn't our time be better spent just building up social movements? Still, we should look further. The divisions that exist in the broad libertarian milieu are drawn for the wrong reasons. We can’t believe today that people doing the solid work we aspire to are politically divided based on the validity of today's divisions. In too many ways we have inherited the politics of other time periods that consistently shows itself to be inadequate in our daily practice. Given our historic task of the anarchist project, and creating a politics for our time, we cannot ignore a key responsibility we have-- which is to become a pole, that attracts and unifies the forces that seek libertarian revolution, and pushes struggle further, going beyond the walls and limits thrown up by reformism, authoritarians, and the weight of the system on us all. With whatever forces we have, we need to strengthen the work we do, and find a unification that brings together those working outside of organizations and those outside of our milieu behind projects that redefine politics in our time. In other words, we should look skeptically at the existing perceived political divisions, not be held to the limitations of existing projects, and we should refuse the idea that it is not possible to bring together the best of what exists today to transform the current political alignments into a better and higher quality struggle tomorrow. There are three helpful reference points that, we believe, are useful to draw upon from political organizations of the immediate past within the libertarian left. The first would be the role of the publication Love and Rage by the Love and Rage Revolutionary Anarchist Federation (1993-1998), which emerged out of the protest politics of the 1990s. With a final press run reported at 9,000 their well-produced monthly publication featured a range of debate and was read and respected outside the anarchist milieu. While Love and Rage as an organization had a number of tendencies and practices that coexisted together, their publication stands out as an example of the creation of a visible pole of anarchism within the larger left. With the maturing of the North Eastern Federation of Anarchist Communists (2000-Present, now Common Struggle - Libertarian Communist Federation/ Lucha Común - Federación Comunista Libertaria), originally as a bi-national organization in the US and Canada, we saw a concrete reorientation away from the protest politics and summit hopping of the 1990s and early 2000s towards engagement with and commitment to building mass oriented social movements as opposed to activist mobilization. Finally, the organization Bring the Ruckus (2002-2012), in part founded by former members of Love and Rage that included anarchist and non-anarchist members, left a legacy (among many other ideas) of a collective strategy built around a common analysis. What this meant in practice was a set of criteria for their organizing work and regular evaluation of how their local level organizing met or fell short of their political goals. These three examples present starting points which we can build on to create new examples for the current political moment. The organization of today is not that of 1917, 1936, or even 2001. Our moment in history has its own needs, its own challenges, and potentials. Given the state of the left and of the working class, we can’t expect nor aim to create political organization modeled on previous upheavals. A political organization today is not the vehicle of social revolution. Struggle changes everything, including organization, and we can only try to anticipate and prepare for transformations that we cannot fully understand or control. Part of taking this into account is acknowledging that we cannot lay out the ideal picture of what a political organization should look and act like and expect all the good people to simply “get on board.” This simply won't happen. Rather than an idealized endpoint, political organization should be seen as a process that must be built conscientiously through on the ground work, the creation of a pole of ideas, meaningful relationships, and political struggle over time. In terms of social struggles, we stand in a difficult place. There are limited elements of movements, but these experiences are largely too isolated, fragmented, and insufficient. For these reasons, today an intermediate approach to struggle is the primary method we believe militants should be utilizing. An intermediate approach involves working at the level of militants in struggle united around a practical orientation to their work (unlike the mass or political orientations who target everyone or those united by specific politics respectively). The intermediate approach seeks to build autonomous power through struggle, by those reflecting on their work, taking a libertarian methodology within, and over time creating a force capable of responding to the ups and downs that occur within struggles. Further, it is united by strategic objectives built through experiences and not merely imposed ideologically. Such an intermediate force could be able to push the potential of struggles further in situations where established power breaks down. Yet our experiences in workplaces, communities, and schools has suggested that this kind of work can also give us tools in our time that are not otherwise available. An intermediate approach gives us clear work when we cannot force mass organizations that aren't in immediate reach, nor political organization where there are no militants. Overall our main stresses are that if we wish to work towards and become the movement we profess to believe in, then we need to think in broader terms fighting not just for today but also for the future. We cannot limit ourselves to being the proverbial frog at the bottom of the well, convinced that the sky is only as wide as the opening of the well.13 Neither can we wait till social explosions arrive on our doorstep to build the skills and infrastructure we need - it will already be too late. We hope that the criticism and points that we’ve outlined can be a starting point towards this. But importantly we want to be clear that by stating the case for national political organization it does not mean we believe that this is automatically possible or even something immediately desired. Political cohesiveness, development and praxis14 are not end goals declared that we can find ready made formulas to create, but rather processes that are built qualitatively over time. 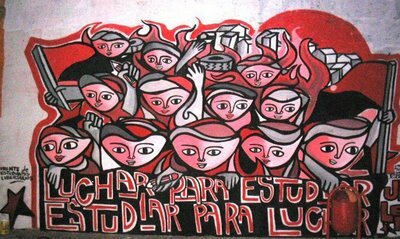 Examples that we may be able to draw from are the Especifist current within Brazilian anarchism that has spent well over a decade linking together local and regional groups and attempting to develop a coordinated praxis under the network of the Forum of Anarchist Organizations, and most recently in consolidated into the Brazilian Anarchist Coordination. While class struggle Anarchists in North America have spent already more than five years building links and exchanges, this is not to say that ten years of work is the required prerequisite either. Likely a range of experimentation, with pitfalls and disappointments along the path, and perhaps even under various organizational banners, will provide the necessary trial and error. But the journey only begins with a firm understanding of our present limitations coupled with a vision of what we are attempting to create; after this there is only one foot in front of the other. 5That isn't to overestimate our powers of prediction. Speculative politics typically is a lottery. With foreseeable problems however we can both practice and prepare. This is different from believe that we can anticipate or build revolution step-by-step, a model which can exacerbate conservative tendencies in politics. "if we wish to work towards and become the movement we profess to believe in, then we need to think in broader terms fighting not just for today but also for the future". This had some interesting stuff in it. Any more english-language info on or writings by folks from the FEL? Also, and maybe there is a thread for this, but what are some concrete things we could be doing WITHIN the IWW for instance, or that a political org would provide for? It seems like mostly a training ground for admin/ reducing the duplication of admin as well as uniting around active political/theory development (something that could be done in the IWW with Branch publications perhaps? ).